When a brewery uses such quotes as “beer is proof that God wants us to be happy”- you know they’re serious about their beer. Inveralmond Brewery, founded in 1997 in Perthshire is one such brewery. Using water sourced from the Perthshire and Grampion mountains they make a wide variety of beers linked by a Scottish heritage and represented by Celtic imagery such as Lia Fail, Thrappledouser, Ossian and the mighty Blackfriar at 7%. Seasonal beers include Pundie, Inkie Pinkie and Duncans IPA. To ensure their beer gets as wide an audience as possible a decision was taken to invest in one way keg technology as to date only returnable 30 litre stainless steel kegs were being used. Petainer was selected due to it’s ease of use in a wide variety of outlets without specialist equipment such as compressed air. Petainer also makes for a very economical package. nomic and environmental benefits when compared with metal kegs and other plastic variants. The variety of sizes and the associated range of fittings mean that there is a suitable keg for a variety of beverage application in bars, pubs, clubs and restaurants worldwide. All the kegs are available with one-way, low cost fittings which allow them to be connected to existing tapping systems for draught beer. 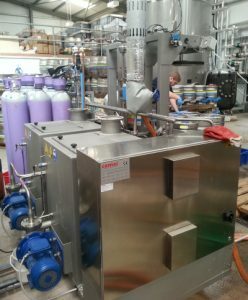 To service this requirement a two head keg washer/filler manufactured by Comac and supplied by Enterprise Tondelli was purchased. The very versatile kegger wash/fills standard 30 litre stainless steel kegs as well as fill only Petainers. Variants are available from Enterprise to fill other types of one way kegs on either dedicated or dual purpose machines. High speed one way keg fillers are also available. The operator touch screen has a number of programs that can be adjusted by the customer to meet the varying washing and filling requirements. The unit can be used as wash only or wash and fill. Two onboard service tanks for internal washing of the kegs allow a very easy install with just plug and use connections. One service tank is for hot caustic with the other being for peracetic acid to ensure effective cleaning. Internal cleaning of the keg is carried out with alternating pressures. Using high pressure for the base and sides and with low pressure for the spear ensures the entire internals are cleaned properly. Pulsing of the flow also helps to remove any debris or dirt. Additionally an extra step of cleaning is used for the filling head between each fill. 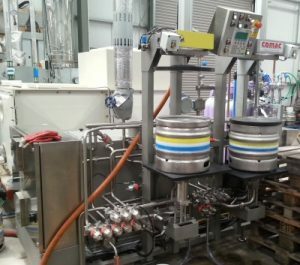 The two head Comac keg filler is just one example of the full range of kegging equipment supplied by Enterprise Tondelli from Comac of Italy. The range includes from single head keggers to complete lines for over 1,000 kegs an hour and can be seen on the website: kegging or telephone 0044 1525 718288.